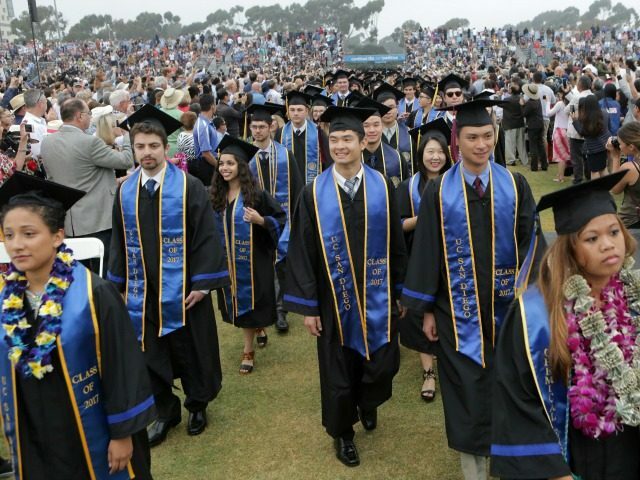 The federal government quietly rewarded companies and universities which hired roughly 330,000 cheap foreign graduates in 2016 instead of hiring American graduates, many of whom are deep in debt. There is no cap on the OPT program, which quietly and semi-automatically gives work permits lasting up to three years when requested by foreign students who graduate from U.S. universities and colleges. Companies are not required to even interview Americans before hiring OPT graduates — and they get tax breaks for hiring foreigners over Americans. “The government is enticing employers to hire foreigners instead of Americans … it is ridiculous,” said Mark Krikorian, director of the D.C.-based Center for Immigration Studies. Even the middle-class Americans who have downplayed the impact of cheap-labor immigration on blue-collar Americans should be alarmed by the government’s discrimination against their own college-graduate children, he added. In 2014, the OPT program provided work permits to 249,998 foreign graduates, according to the data provided to Breitbart News by the Department of Homeland Security, which oversees the program. Two years later, the number of new foreign graduates entering the program had risen by 32 percent up to 329,158. The program provides a one-year work permit to all graduates. It also provides an extra one-year permit to graduates who work in a so-called high-tech “STEM” job. In 2016, officials working for former President Barack Obama extended the STEM permits from one year to two years. If only 20,000 of the 51,672 STEM workers from 2015 used Obama’s one-year extension, they would have increased the 2016 total from 329,158 up to 350,000. That 350,000 estimate for 2016 means that the government is offering work permits to one foreign graduate for almost every two of the 800,000 young Americans who graduate from college each year with high-skilled degrees in business or medicine, science or software, math or physics. The OPT program will likely grow to 500,000 foreign workers in 2020 unless it is killed by a pending lawsuit. Under the new transparency rules established by DHS secretary John Kelly, DHS officials also provided Breitbart with the initial OPT numbers for 2017. That data showed the OPT program in the first half of 2017 by giving work permits to 255,412 foreign students, including 57,315 high-skill technology graduates. That half-year number for 2017 is larger than the 2014 total. These high numbers likely understate the scale of the OPT outsourcing program, because the federal government also allows foreign students to get a one-year work permit via the “Curriculum Practical Training” program before they graduate into the OPT program. If 100,000 students used that CPT program in 2016, then the combined CPT and OPT programs delivered almost 450,000 white-collar American jobs to foreign students and graduates in 2016. The annual inflow of new foreign OPT workers is now roughly three times larger than the annual inflow of 110,000 H-1B white-collar contract workers. However, the H-1B program offers longer visas to foreign workers, so it keeps a larger population of roughly 650,000 foreign white-collar workers in the United States, compared to roughly 35o,000 OPT workers. The H-1B visas help companies hire foreign white-collar workers to take the place of the experienced American professionals who need decent salaries to help support and educate their children. Heating, Ventilation, Air Conditioning and Refrigeration Engineering Technology/Technician … solar energy … welding … industrial production … quality control … automotive engineering … [and] biology. In a recent report, the Federal Reserve Bank of New York went deeper and looked at underemployment among recent grads (defined as people aged 22 to 27 with at least a bachelor’s degree). The Fed researchers used data from the Census Bureau and the Bureau of Labor Statistics to examine whether employed grads were in jobs that typically required a college degree, what those jobs paid, and whether they were working full- or part-time. They found that in 2012, about 44% of grads were working in jobs that didn’t require a college degree — a rate that, while about what it was in early 1990s, increased after the 2001 and 2007-09 recessions. Only 36% of that group were in what the researchers called “good non-college jobs” — those paying around $45,000 a year — down from around half in the 1990s. The share of underemployed recent grads in low-wage (below $25,000) jobs rose from about 15% in 1990 to more than 20%. About one-in-five (23%) underemployed recent grads were working part-time in 2011, up from 15% in 2000. 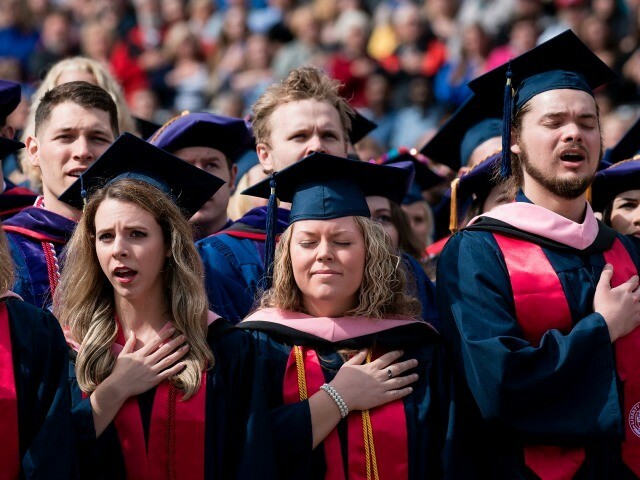 Other reports emphasize negative and positive prospects for recent college grads as the nation emerges from a decade-long slump. Moreover, many U.S. graduates are defaulting on college loan debts owed to the U.S. government because they cannot find well-paying jobs. Joseph Palos, a high-tech graduate from Cornell University, formally objected to the OPT program in 2015. ”Companies don’t want to hire Americans and they abuse… OPT to hire cheap immobile labor instead of hiring anyone over the age of 35, especially in software or tech areas,” he wrote to a federal agency, according to a report in ComputerWorld. Most universities and colleges hide useful data about their OPT programs from their American students, the tuition-paying parents, and the voting public. But a Breitbart search of the data revealed that Penn State posted a list of companies which hire OPT and other foreign graduates. The companies include accounting firms Deloitte & Touché LLP plus Ernst & Young, LLP, as well as Goldman Sachs, Citigroup and the GE Global Research Center in New York. 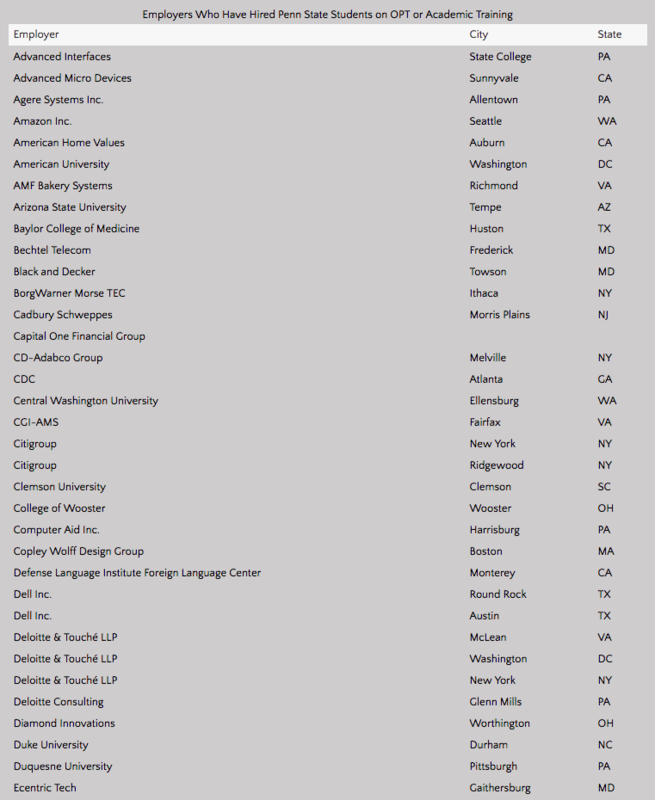 Other OPT employers included Advanced Micro Devices in Sunnyvale, Calif., Intel in Arizona, Motorola in Florida, Nokia in Texas, and Microsoft in Washington State, plus Cadbury Schweppes in New Jersey, Glaxo Smith Kline in Philadelphia, Hyatt Hotels in Washington D.C., Westinghouse in Pittsburgh, Penske Logistics in Ohio, and the Environmental Systems Research Institute in Redlands, Ca. 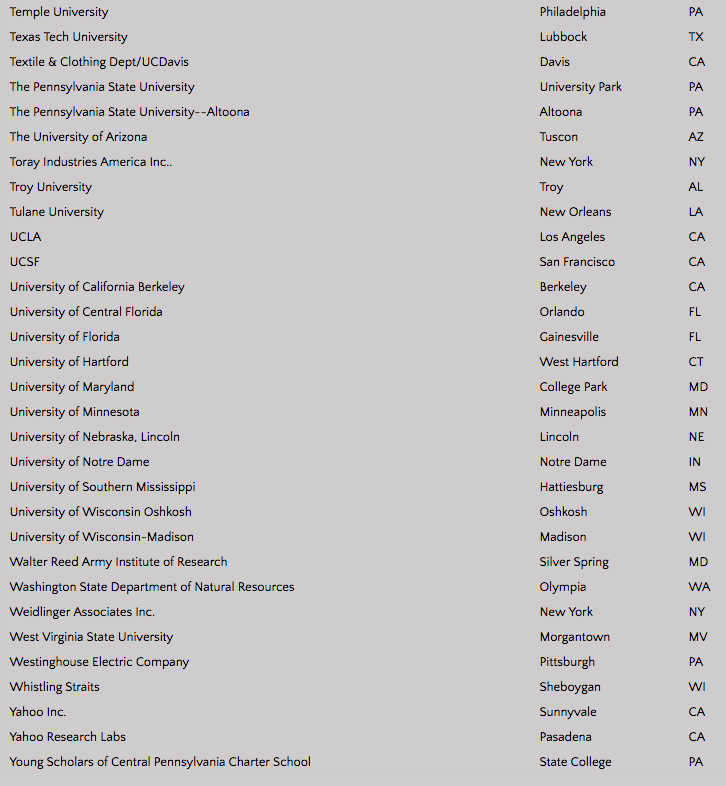 The Penn State list also includes many universities, many of which can keep cheap OPTs on the payroll for several years by converting them into H-1B employees. There are no limits on universities’ hiring of H-1Bs. There’s not much reason to blame the companies for hiring OPTs, said Krikorian. By reducing employers’ taxes and subsidizing OPT employees’ pay with a chance to win green cards, “the government is encouraging these employers to hire foreign workers,” he said. Who supports the OPT program? Unsurprisingly, the semi-secret OPT program has intense behind-the-scenes support in Washington. When a job is given to an OPT worker, neither the worker nor the employers have to pay Social Security or Medicare taxes. That tax break cuts the company’s salary costs for that foreign worker by roughly 23 percent. When foreign students can get jobs, Americans lose bargaining power to get decent wages for their jobs. Nationalwide, the extra inflow of immigrant labor annually transfers roughy $500 billion from employees to employers, according to data in the 2016 report on immigration by the National Academies of Sciences. The OPT jobs put the foreign graduates on the first step towards citizenship, which is a hugely valuable deferred bonus for the students, their overseas famillies and their descendants in perpetuity. In effect, the federal government provides OPT workers a high liklihood of winning the citizenship prize if they work for the pay and conditions set by the employer. But this is also a huge hidden subsidy for employers who hire foreigners instead of Americans because it allows employers to pay foreigners with the hope of citizenship, while Americans must be paid in dollars. Also, the OPT employees are heavily dependent on the employers to put them on the next step to citizenship. This dependence ensures a compliant attitude despite low pay and long hours. The next step is usually a H-1B visa, which requires the employer to ask the government for the visa. The OPT program is also backed by business because it adds to the number of native-born and immigrant consumers in the U.S. economy. The annual inflow of foreign students adds $2.8 billion in economic activity, and 400,000 jobs to the economy, including many in universities, says the NAFSA advocacy group, wich is led by university officials. Few politicians are willing to openly disagree with the universities in their district. Universities market themselves to foreign customers as way-stations to citizenship. For example, Dartmouth University highlighted employment statistics for foreign graduates, saying 71 of 79 foreign graduates got work permits and jobs in 2015, and 79 of 86 got work permits and jobs in 2014. A growing percentage of foreign students are using the OPT work permits. The percentage rose from 21.5 percent in 2014 up to 24.5 percent in 2016, according to DHS data. Education-industry officials have downplayed the number of OPT approvals for several years. For example, the New York-based Institute of International Education estimated 67,804 OPT job-seekers in 2009, and 147,498 OPT seekers in 2016. In contrast, DHS estimated the numbers at 91,140 in 2009 and 329,158 in 2016. GOP House Speaker Paul Ryan backs programs that allow low-tech business to import cheap foreign workers instead of hiring U.S. workers. “We need to have an immigration system that is wired for what our economy needs … so let’s find out where those gaps in our labor markets are and have our immigration system wired for that,” Ryan said in 2016. Under Obama’s lax border policies, roughly 550,000 additional illegal aliens flew or walked into the United States in 2016, while only a tiny percentage of the 11 million resident illegals were sent home. This bipartisan open-border viewpoint is part of the law and played a large role in Obama’s policies. For example, from 2011 to 2016, Obama used a loophole in federal law to allow more than 300,000 unskilled migrants from Central American to live and work in the United States, despite the harmful impact on the kids’ schools and local crime rates. These pro-immigration views held by progressives and business-minded Republicans means that the federal government now imports one million legal immigrants each year to compete for jobs against the 4 million Americans who graduate from schools or colleges each year. The federal government also imports more than 1 million temporary contract workers, including roughly 110,000 H-1B workers per year. That rapid rise of the secret OPT program — plus likely rises in other semi-secret L and B-1 visas — suggest that the government allows companies and universities to keep an army of more than 1.6 million foreign contract-workers in the United States. Most of those foreign contract workers are white-collar professionals, while fewer than 100,000 are legal temporary agricultural workers, according to the left-of-center Economic Policy Institute. 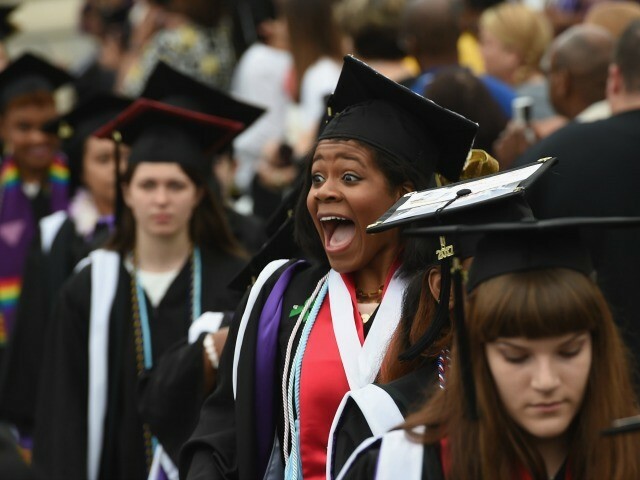 2017 graduation ceremonies at Agnes Scott College, Decatur, Georgia. This social conflict also distorts Americans’ politics, allowing the inauguration of New York real-estate magnate Donald Trump on January 20, 2017. Since then, despite massive bipartisan pressure from politicians and industry groups eager for cheap labor, Trump has declared his policy to be “Buy American, Hire American.” He has scuttled the cheap-labor Trans-Pacific Partnership program, sharply reduced illegal immigration, slowed the growth of contract workers programs, started reforming the H-1B white-collar outsourcing program, and eliminated the ‘DAPA’ amnesty for four million illegals. Because of pressure from progressives in the media and the Democratic Party, Trump has also preserved some of Obama’s open-borders rules, such as the 2012 ‘DACA’ policy which delivers work permits to roughly 765,000 younger illegals. So far, Trump and his deputies have done little publicly to curb the fast-growing OPT program — even though it discriminates against the children of politically influential college-graduates. “You would think that when their own college-educated kids are being discriminated against, it would get attention,” said Krikorian. However, in December 2016, the Department of Education disbarred the accreditation organization which validated the NPU’s educational claims. In March 2017, Trump’s DHS stopping issuing OPT or H-1B approvals to foreign students from the diploma-mill colleges which rely on that accrediting organization. However, Trump’s officials will soon need to deal with the legality of the “crony capitalist” OPT program, said lawyer John Miano, who is suing the federal government on behalf of the Washington Alliance of Tech Workers. His lawsuit shows how OPT was created by regulators in 1992 and then expanded in 2002 without any action by Congress or an agency regulatory process. The legal claim is strong, he said, because “we have the government making law via regulation… [what is] the largest guest worker program” in the nation. 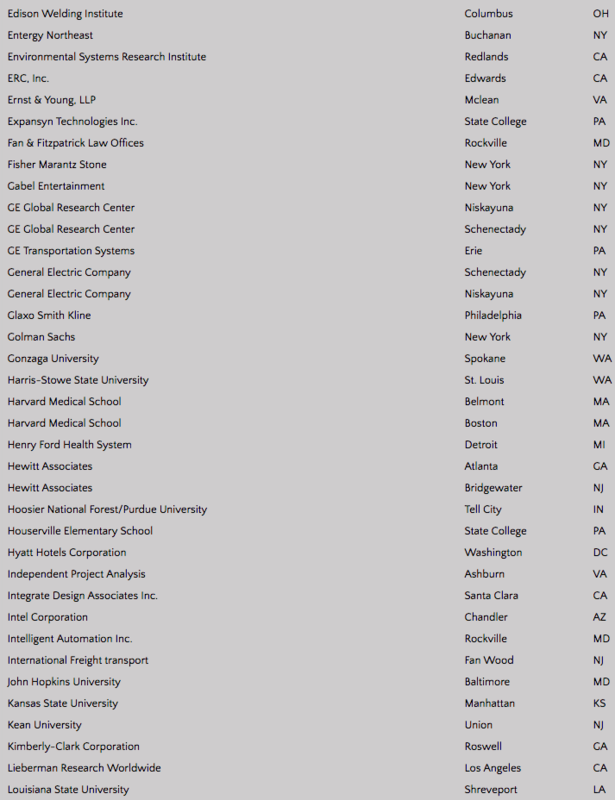 Below are four images of the Penn State list of companies that hired OPT or “Academic Training” foreign graduates. Many of the companies and universities also hire H-1B workers.